Whether you’re a fan of daylight savings time (DST) or not, we all have to deal with it! 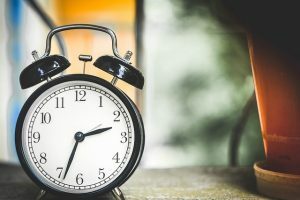 Recently, there has been an increase in studies that show the effects that a 60-minute time change can have on the body, health and even traffic safety. For instance, road related accidents usually increase both after DST ends in November and begins in March. Whether it’s due to a lack of sleep, less light to illuminate our roads, or people just not adjusting their behaviours, it’s important that we are staying safe on the roads! Read on for three tips on how to stay sharp when daylight savings time comes around. Saturday and Sunday of the Spring time change. This will make waking up that extra hour earlier come Monday not quite as difficult, because your body will already be adjusted. Eat a healthy breakfast. Food often acts as a trigger, letting your body know that it’s time to start the day! Fill your morning with well-lit rooms (natural sunlight is even better). This will help your internal body clock adjust to the change. You can go from feeling awake to drowsy in a short period of time, so stay aware and always pull over if you feel too tired to focus on the road. This tip is especially relevant when DST ends in November. While people get to sleep in an extra hour, the amount of light when people are driving to and from work is greatly reduced. Less light means decreased visibility of other vehicles and pedestrians. Always ensure that your headlights are on, and dim your interior lights to avoid glare. Approach all crosswalks slowly and with caution, keeping an eye out for cyclists and pedestrians. Lastly, don’t rush. Give yourself enough travel time so that you are able to adjust your speed to the changing road conditions. When DST ends, it’s a sign that winter is on it’s way here in Alberta. If you install winter tires each season, the end of daylight savings time is a good reminder to start thinking about switching over! It’s recommended that you put your winter tires on once the temperature is below 7 degrees. Keeping up with other regular vehicle maintenance will ensure that your brakes, engine and more are all working in tip top shape and will keep your vehicle running at peak efficiency at all seasons. Just because you’re awake and alert doesn’t mean that other drivers on the road are as well. Make sure your auto insurance protects you from accidents and collisions. If you have questions about your auto insurance, or would like to receive a quote, give the team at ARC insurance a call!